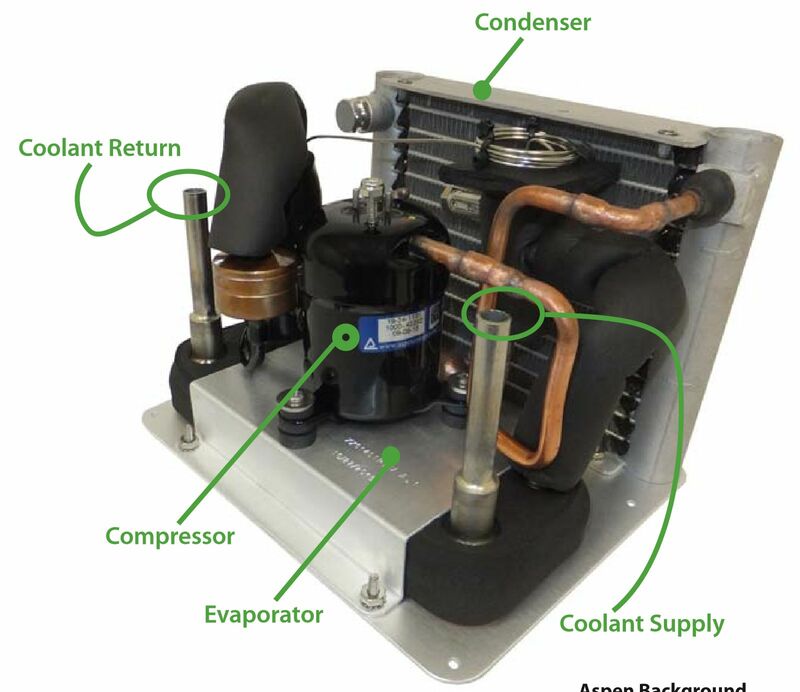 Vapor Compression Refrigeration – Aspen Systems provides active thermal management for laser, industrial, medical, semiconductor and military applications. 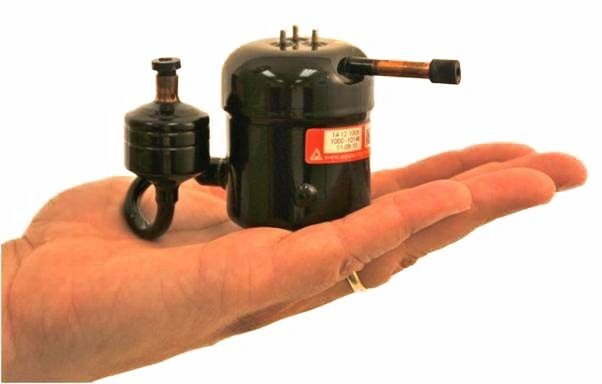 They developed and commercialized the world’s smallest rotary compressor for electronics cooling for the military with over 2,500 units deployed in Iraq and Afghanistan. They also specialize in liquid chiller modules and direct refrigerant systems. 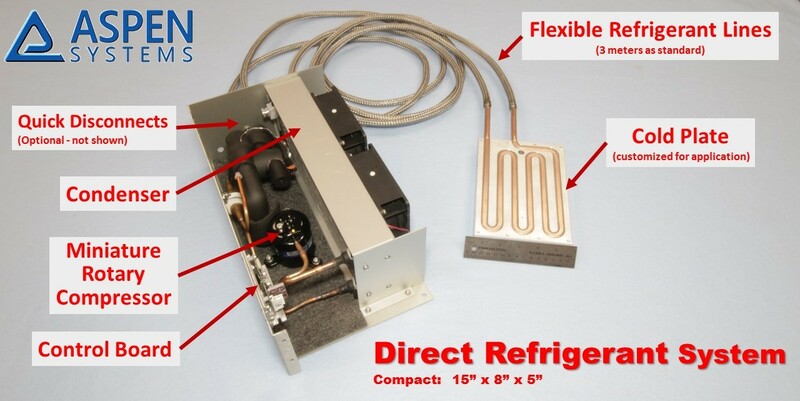 Direct Expansion System or direct refrigerant system is particularly appealing to laser manufacturers, large end users and system integrators. The compressor drives the refrigerant directly through the laser cold plate. This concept eliminates the need for a water cooling loop (water pump, reservoir and associated tubing) resulting in a greatly simplified cooling system. The dimensions are incredibly small for a system with over 500W of cooling capacity — 6”x8”x5” (~15 cm x 20 cm x 13 cm). In some laser designs, this system can be easily integrated into the laser power supply. It is the most efficient cooling system on the market requiring only 350W of electrical power for maximum cooling. A DC brushless motor powers the compressor and is available in 24Vdc or 48Vdc versions. Additionally, due to its small size, high reliability and high efficiency, the ‘DX’ direct expansion system has found numerous applications, particularly in patient care and medical devices. Aspen’s successful prototypes and advent into practical applications is creating an exciting new platform. Liquid Chiller Aspen’s Liquid Chiller Module (LCM) is the refrigeration engine used as a laser chiller for medical and patient cooling along with many other applications. The original equipment manufacturer simply adds the water pump of their choice, reservoir, water lines/fittings and condenser fan to create a turn-key solution. The LCM is very compact and lightweight, measuring just 7.8” x 6.3” x 5.3” (10.9cm x 16.1cm x 13.4cm) and weighing 6 lbs. Electronics Cooling Aspen’s ECU-CHILL® 550 is an extremely compact, lightweight, ruggedized air conditioning system for cooling electronics in sealed enclosures and for mobile applications. 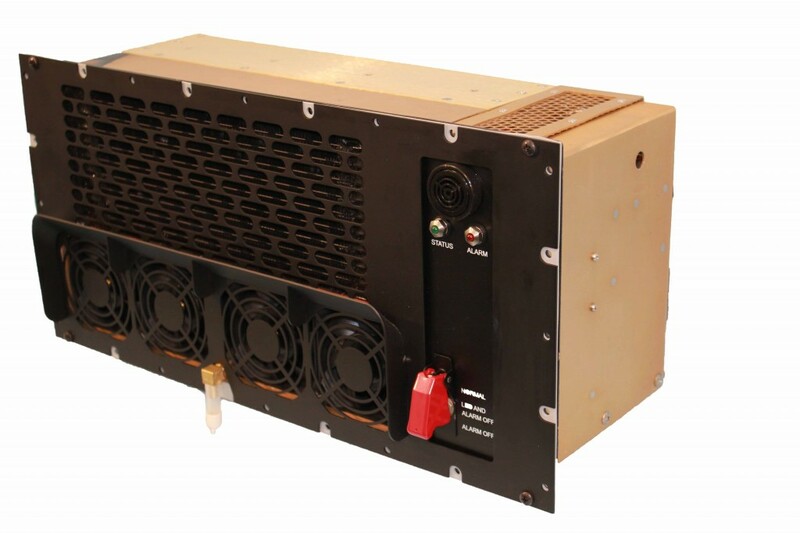 The system actively manages air temperatures with a 300 watt heater and refrigeration system in sealed enclosures at or below ambient temperatures, allowing Commercial-Off-The-Shelf (COTS) electronics to be used for computing and communications in extreme environments (hot or cold). It will also control the enclosed air to 70% relative humidity levels. The ECU-CHILL has been fully ruggedized for military use to MIL-STD-810, MIL-STD-1275, and MIL-STD-461. Weighing in at less than 20 pounds, the ECUCHILL® 550 will continuously maintain a set point temperature while absorbing 550 watts of heat. The ECU-CHILL® 550 uses Aspen’s miniature rotary compressor. The system circulates the enclosure air, heating or cooling as required to maintain the user defined temperature. The ECU-CHILL® 550 is used to manage the temperature in rack-mounted electronics in transit cases. Most major transit case manufacturers have a cooling collar mount for the ECU-CHILL® 550. Custom Cooling The engineers at Aspen Systems are expert in active thermal management employing vapor compression refrigeration. They have provided hundreds of custom refrigeration systems for their customers. Contact Aspen today for a free evaluation of your application. Tel 508 281 5322 • e-mail: info@aspensystems.com and visit their website at www.aspensystems.com.